Yeshua is Eternal Life. Well respected professionals, Doctors and Scientists have testified of their Out of Body Experiences (OBE) and Near Death Experiences (NDE) of Heaven and Hell. Their testimonies agree. Just like the scripture has been saying for years, Yeshua is Eternity Life because He is the Giver of Life! No one has concurred death except for Him. Where will you go after you die? 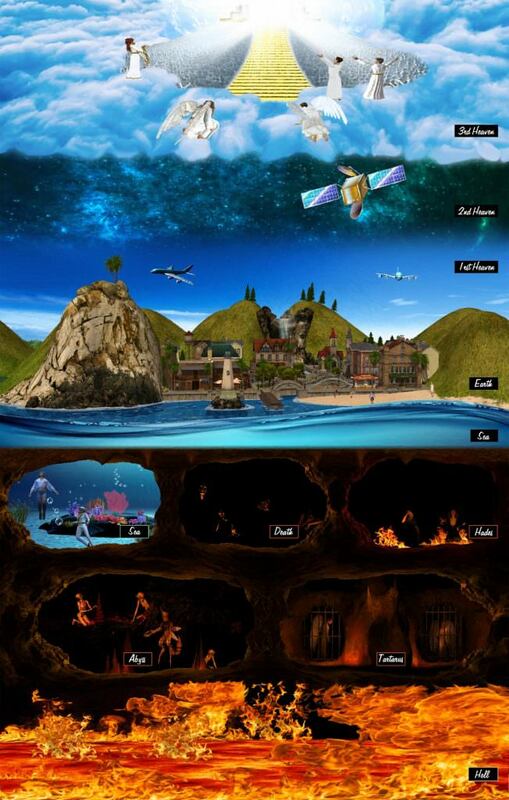 Nowhere, Hades, Death, Sea or Heaven? However True Believers in Yeshua (Jesus) will instantly go to Heaven when they die (2 Cor. 5:1-8; Phil. 1:23; John 14:2; 17:20-24; 1 Peter 1:3-5, 8-9; Acts 7:56-59). “Repent, and let every one of you be baptized in the name of Jesus Christ for the remission of sins; and you shall receive the gift of the Holy Spirit” (Acts 2:38). “For by grace you have been saved through faith, and that not of yourselves; it is the gift of God, not of works, lest anyone should boast. For we are His workmanship, created in Christ Jesus for good works, which God prepared beforehand that we should walk in them” (Eph 2:8-10). “If you confess with your mouth the Lord Jesus and believe in your heart that God has raised Him from the dead, you will be saved. For with the heart one believes unto righteousness, and with the mouth confession is made unto salvation” (Rom 10:9-10). WHY CAN’T THERE BE ANOTHER WAY? All have been bitten by the serpent of sin, all are unholy and sinful. Therefore God provided His Son as the antidote to cleanse us from our sin and reconcile us to Him. “For Christ also suffered once for sins, the just for the unjust, that He might bring us to God, being put to death in the flesh but made alive by the Spirit” (1 Pet. 3:18; Rom 3:25). “For if when we were enemies we were reconciled to God through the death of His Son, much more, having been reconciled, we shall be saved by His life” (Rom 5:10). “He who has the Son has life; he who does not have the Son of God does not have life” (1 John 5:12). We are not our body but we do live in our body. As Paul describes (2 Cor. 5:1-8), For we know that if our earthly house, this tent, is destroyed, we have a building from God. A house not made with hands, eternal in the heavens. For in this we groan, earnestly desiring to be clothed with our habitation which is from heaven. If indeed, having been clothed, we shall not be found naked. For we who are in this tent groan, being burdened. Not because we want to be unclothed, but further clothed, that mortality may be swallowed up by life. Now He who has prepared us for this very thing is God, who also has given us the Spirit as a guarantee. So we are always confident, knowing that while we are at home in the body we are absent from the Lord. For we walk by faith, not by sight. We are confident, yes, well pleased rather to be absent from the body and to be present with the Lord”. Father, I desire that they also whom You gave Me may be with Me where I am, that they may behold My glory which You have given Me; for You loved Me before the foundation of the world” (John 17:20-24). When Stephen was stoned he looked up and said, “Look! I see the heavens opened and the Son of Man standing at the right hand of God!”… And they stoned Stephen as he was calling on God and saying, “Lord Jesus, receive my spirit” (Act 7:56, 59). “For our citizenship is in heaven, from which we also eagerly wait for the Savior, the Lord Jesus Christ” (Phil 3:20). “Blessed be the God and Father of our Lord Jesus Christ, who according to His abundant mercy has begotten us again to a living hope through the resurrection of Jesus Christ from the dead, to an inheritance incorruptible and undefiled and that does not fade away, reserved in heaven for you, who are kept by the power of God through faith for salvation ready to be revealed in the last time. …whom having not seen you love. Though now you do not see Him, yet believing, you rejoice with joy inexpressible and full of glory, receiving the end of your faith—the salvation of your souls” (1 Peter 1:3-5, 8-9). They will not be going to Heaven because their sin remains. The place for non believers is a place called Hades and Death. They will remain there until judgement day, where they will be judged based on their works. It will be more tolerable for those who haven’t heard of Yeshua than those who have and rejected Him (Matt. 11:24). In the book of Revelation, John speaks of what he sees, Then I saw a great white throne and Him who sat on it, from whose face the earth and the heaven fled away. There was found no place for them. I saw the dead, small and great, standing before God, and books were opened. Now another book was opened, which is the Book of Life. The dead were judged according to their works, by the things which were written in the books. The sea gave up the dead who were in it, and Death and Hades delivered up the dead who were in them. And they were judged, each one according to his works. Then Death and Hades were cast into the lake of fire. This is the second death. And anyone not found written in the Book of Life was cast into the lake of fire” (Rev. 20:11-15). Hades (Matt. 11:23; Ps. 9:15; Luke 16:23; Rev. 1:18). The stress, death, rebirth of a lawyer video in the Yeshua Eternal Life link is amazing. As a student of apologetics I really enjoy testimonies from skeptics (lawyer’s are great skeptics!) who have encounters with Jesus. These life or death experiences that create a catalyst to have a deep one on one encounter with God let us know that God is there and He does reveal himself in so many rich and amazing ways. The Video “Gunshots” is inspiring because this performer who strived to make it in the Hollywood superficial world which the world relentlessly pounds into us as being the most important one , was nudged by God to work for Him as a gospel singer. He got shot and died for a time but came back and as far as can be seen, after 5 bullets hit him he seems to be without any lingering physical issues, praise the Lord! How awesome is it to know that no matter what we’ve done and where we’ve been, God loves us. Jesus can change all of it in a moment when we surrender to Him. Praise God!! A good reminder that we can’t truly live life without the end in mind. Crushed and … How merciful is our God that He would give some of us a glimpse into the world He has planned for us and save us – He leaves no detail untouched! I cried when I watched” burned and died” and I couldn’t understand exactly why. It must be God’s presence. Wonderful! It reminded me that there is life after death and it helped me not to worry about the daily stresses in front of me. God is all too real to ignore. He loves you, He cares about you, and He wants a relationship with you today. Watching these videos of people experiencing both hell and heaven shows us what a gracious and merciful God we serve. He gives us a glimpse of eternity because He loves us so much and doesn’t want us to make the wrong choices in life. He wants us to choose Him. Thank you Yeshua! After watching Yvonne Sklar’s visit to heaven and hearing again God’s reminder to ask for both the big and the small things, because He cares about everything in our lives, because His laws are perfect and we are to keep them, I’m amazed that He loves us so much in spite of our failures, and so very grateful for His forgiveness and His call on our lives to serve Him. Thank you Father! What I like about this is that many people who don’t know each other, share the same thing. All talk about what they saw either after death or at the point of death or out of body experiences (OBE) or near Death Experience (NDE). Some saw Heaven (Paradise) and others saw Hades (place of torment). They all coming back to give us a warning. Even blind people from birth share what they see as they leave a body and describe in detail shocking the doctors. OBE and NDE are scientific medical evidence of the afterlife. It’s amazing how so many of these testimonies have consistent details about what Heaven looks like and how individuals feel and experience the same things. I’m so glad that these people were able to find a platform to tell the world about how Heaven and Hell are real. Near Death Experiences and Out of Body experiences is a scientific fact. Remember the movie flat liners – this wasn’t so far from the truth. This blows in the face of evolutionists because there are no cells at all, it goes into the spiritual world. Wikipedia states: A near-death experience (NDE) is a personal experience associated with death or impending death. Such experiences may encompass a variety of sensations including detachment from the body, feelings of levitation, total serenity, security, warmth, the experience of absolute dissolution, and the presence of a light. Neuroscience research suggests that an NDE is a subjective phenomenon resulting from “disturbed bodily multisensory integration” that occurs during life-threatening events.” Many cases of people reporting seeing their bodies and seeing people around them. Describing in great deal. NDE of events was thought to be an hallucination but reported to be erroneous as the events described were crystal clear, factual and not erratic like hallucinations. What a testimony – Jesus touches the lives of people like you and I – normal people who need to know HIM . There are so many people that God touches and they share the same story …. What an awesome God we serve! Let’s look at scripture because we agree that this is the only measuring stick. Is Yeshua contradicting what was said earlier in scripture as both Elijah or Enoch ascend to Heaven in a physical body. Obviously not. Could Yeshua be meaning that no one can talk about things they don’t know about? Correct, they can’t talk about Heaven unless they have seen it, it is not that no one has seen things in Heaven or been to Heaven. For example; Moses has seen heavenly things but didn’t necessarily go to Heaven (Heb. 8:5 – Same with Ezekiel etc.). Also, both Enoch and Elijah went to Heaven but didn’t come down to tell what they saw. This is the context. Yeshua said, “Verily, verily, I say unto thee, We speak that we do know, and testify that we have seen; and ye receive not our witness. If I have told you earthly things, and ye believe not, how shall ye believe, if I tell you of heavenly things? And no man HAS ascended up to heaven, but he that came down from heaven, even the Son of man which is in heaven (John 3:11-13).” Perfect interpretation is when all scripture is in harmony and nothing is in tension. If it is in tension then it is not good interpretation. I believe this might be what Rob was meaning. We also know from scripture that this statement from Yeshua was before His resurrection. This was not a command, like “No one will ascend to Heaven and come down”, but more of a reflection that no one HAS gone to Heaven and come down to tell. We also know from scripture that after His resurrection, people did go to Heaven and did return to tell. We could say 20-25% of the New Testament writers went to Heaven and came back to tell (2/8-9) – Paul (or someone he knew 2 Cor. 12:1-4) and John (Rev. 4:1-2) who ascended to Heaven. Also, the whole book of Revelation is about what John saw and some of it was from Heaven.